E-ink-Reader. Calibration of G-sensor of the screen.. It happens so, that we book an expencive smartphone in China and after getting it find little but unpleasant defects. You can't go to guarantee repair shops in this case, you can just send the device back. 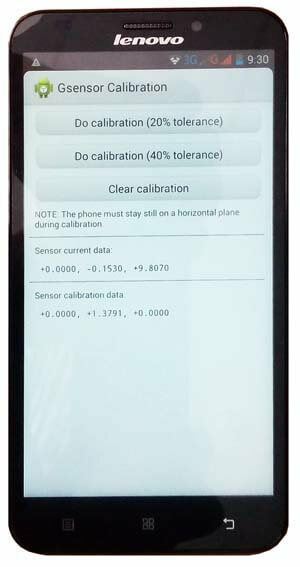 In fact, lots of little problems in the work of madern smartphones, such as calibration of sensors, GPS-reciever, level of volume of speaker and sensitivity of the microphone, can often be solved by using engeneering menu. We'll show how to do it by the example of calibration of G-sensor. G-sensor (or accelerometer) is a sensor of a smartphone, which determines its position relative to the horizontal axis. Basing to the information got from this sensor a smartphone turns the picture on the screen of the device. Many apps ang games use this sensor too. If it is tuned wrongly, for example in the app "Building level Waterpas", or a similar one, the level of horizontal will be moved. Attention:authors aren't responsible for malfunctions of work of your smartphones and tablets, which are got as a result of using this information. Everything you do is at your own risk! The method, which is described lower, is fair for Android-devices based on microprocessors MT65xx, entance codes to the menu and contents of it's points are different for the devices based on other microprocessors. open the app "Building level Waterpas" again to control the changes. There is an app "GPS Status & Toolbox", which has calibration of G-sensor as a point of menu in professional version, but, unfortunately, it doesn't save information without Root-right and the calibration is not done.